Adult Japanese beetles are destroying plants all across the United States and Canada. They have many unique characteristics that make the adults nearly impossible to control. The main characteristic is that adult beetles travel up to two miles in one day to feed. They are drawn to your yard by the smell of your delicious plants. If you spray the beetles, kill them, or trap them, within a few days armies of beetles step right up and replace the ones you kill with more. Unless you plan on killing all beetles within two miles of your yard it’s a hopeless cause. Your Most Valuable Plants will still get damaged. When all traditional methods fail, most gardeners resort to simply shaking them off their plants. That’s why our solution, BugVibes™, makes so much sense. We attach our device to a plant and gently shake the plant for you. Beetles simply fall off and go to a different plant. • Sprays – Sprays kill beetles in your own yard. They wash off when it rains or wear out in a few days. The most common spray, Carbaryl, has many warnings including directions what to do if you stop breathing from inhaling Carbaryl. Unless you spray constantly, your plants and fruit still get damaged. • Beetle Traps – Beetle traps use a beetle pheromone (smells great to them) to attract the beetles to the trap. Beetles come from up to two miles away every day to find your yard. They visit all of your favorite plants (which also smell good to them) while in your yard before being trapped. Widely available university research on beetle traps demonstrates this. • Grub Treatment – Beetles start out in the ground in spring as grubs. Many people treat the grubs in the ground with Milky Spore or other treatments. At best, this only kills the beetle grubs in your yard. 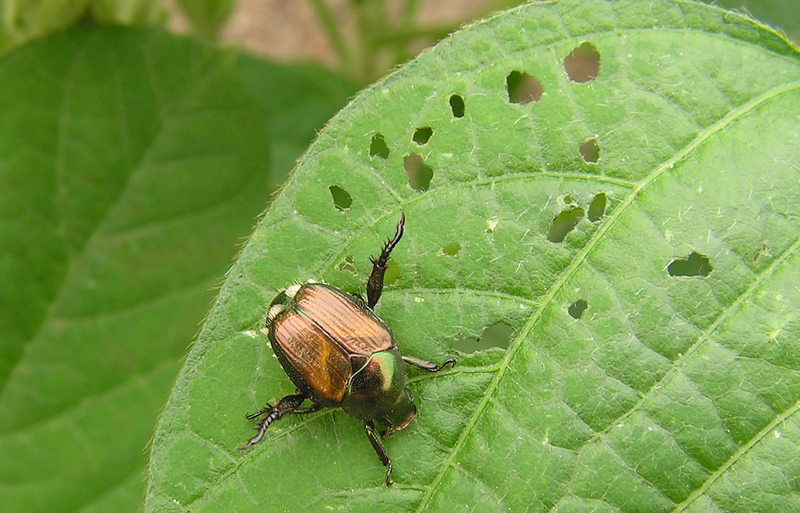 Since beetles travel up to two miles in one day just to eat your yummy plants, grub treatment doesn’t help your plants much against adult beetles. It does help keep the grubs from killing your lawn. THE ONLY REAL WAY TO WIN THE BATTLE IS TO SHAKE WITH BUGVIBES™. We are wondering if we can use your Japanese Beetle photo in a gardening ad for Japanese beetles.